Black and White Photography Blogs List. The Best Black and White Photography blogs from thousands of top Black and White Photography blogs in our index using search and social metrics. Data will be refreshed once a week. About Blog A collaborative black and white photo blog featuring photographers from around the world ! Facebook fans 211. Twitter followers 60. New York City About Blog BWGallerist is dedicated to promoting fine art photography with special emphasis on Black and White photography. Facebook fans n/a. Twitter followers 415. Ottawa, Ontario About Blog I am a self-taught photographer from Montreal, Quebec, and currently living in Ottawa. I’ve been making black and white photographs since 1988, first in the traditional chemical darkroom, and since 2005, digitally. Facebook fans 602. Twitter followers n/a. Charlottesville, Virginia, USA About Blog Black and white photography, essays and blog from the Chesapeake Bay watershed. Facebook fans n/a. Twitter followers 123. About Blog Decisive moments from streets, portraits all as monochrome photography Cuba Mali Syria Senegal Burma. About Blog A Black and white photography blog. Each week this blog will publish on Friday at 6pm Irish time. Vancouver, British Columbia About Blog At Light & Composition, we portray the real images of our civilization, connecting individuals and information. We believe you will definitely get benefited by joining our university, using our articles, books, magazines, and award, and exploring with us. Facebook fans 712,242. Twitter followers 14,159. Holland About Blog All about Black and White Fine Art Photography with tutorials on long exposure photography, B&W conversion techniques and articles from guest writers. Facebook fans 7,583. Twitter followers 7,701. Athens, Greece About Blog An accomplished architect, and internationally acclaimed photographer, author and educator, teaching workshops and lecturing around the world, Julia was passionate about art from a young age, and aims to create it with all the means she has at her disposition. My mission is to push the limits of photography by bringing photography and art together through (en)Visionography. Facebook fans 7,751. Twitter followers 6,459. Malaysia About Blog A good portrait reveals something about its subject beyond the immediate appearance of the photograph. It includes layers of meaning and depth that portray the person as a whole. Covering useful tools, tutorials, tips and inspirational artworks. Facebook fans 123,814. Twitter followers 41,221. About Blog My name is Jonas Dyhr Rask. I’m a Doctor M.D. graduated from the University of Aarhus. I’m an Official Fujifilm X-Photographer and a member of the KAGE collective. I bring this documentary street photography style to my contract photography work, where I function as a documentary wedding photographer, as well as a portrait photographer. North Dakota, USA About Blog I am a black and white landscape photographer, speaker, teacher and mentor from Casper, WY. Facebook fans 1,678. Twitter followers 10. Putten, The Netherlands About Blog André Ruiter (Putten, 1972) is a Dutch photographer specialised in conceptual black & white photography. He is a passionate traveler and his projects bring him to inspiring places like Greenland, Orkney and the Argonne forest and Vosges mountains in France. His projects are based on historic themes and he developed a special interest in 19th century fortifications. Facebook fans n/a. Twitter followers 1,093. Athens, Greece About Blog A source of inspiration about minimalist, black and white photography and also includes fine art, Minimalistic & surrealistic landscape photography. About Blog Welcome to your source for great black-and-white photography. Photographic portfolios and interviews, how-tos and tips for digital and film photography, and the latest news from the Black & White World. I Love Black & White Photography" is designed to be a showcase where both up-and-coming and established photographers can share their work. We love how the world looks in black & white. 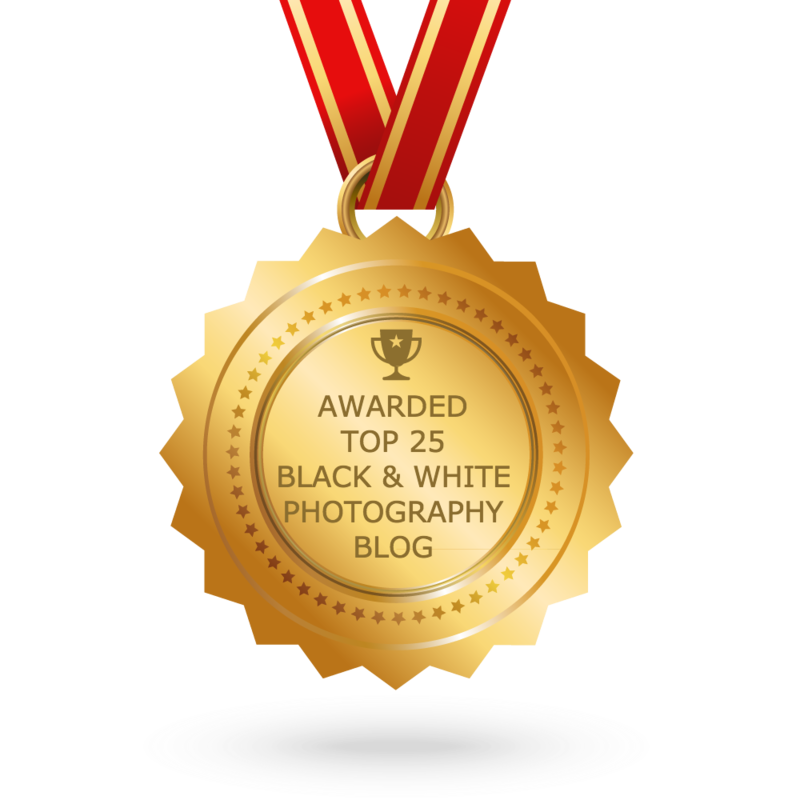 CONGRATULATIONS to every blogger that has made this Top Black and White Photography Blogs list! This is the most comprehensive list of best Black and White Photography blogs on the internet and I’m honoured to have you as part of this! I personally give you a high-five and want to thank you for your contribution to this world.